Sri Lanka Air Force fighter jets launched an air attack at LTTE Sea tiger base located in Mullaithivu district this afternoon, March 30.The targeted sea tiger base was located at Chilawaththa in Alampil and air sorties carried out around 12.40 p.m. today, Air Force sources said.The pilots confirmed that target was hit accurately. A claymore mine was blasted targeting an STF foot patrol in Batticaloa at 9 a.m this morning. One STF personnel killed and three others injured. Students, space enthusiasts, politicians and Buddhist monks paid respects Friday to the late science fiction writer Arthur C. Clarke. Clarke died Wednesday at age 90 after suffering breathing problems. His remains were put on display for public viewing at his home in Colombo, the capital of his adopted country Sri Lanka. "He fascinated a lot of us into being interested in space and astronomy," said Kavan Ratnatunga, a Sri Lankan-born astronomer and long-time associate of the author. Clarke won worldwide acclaim with more than 100 books on space, science and the future. He also founded the Astronomical Society of Ceylon in 1959, inspiring many youngsters by screening films of space mission launches, Ratnatunga said. Sri Lanka used to be known as Ceylon. "He made us all proud by being with us, I became his fan by reading the '2001: A Space Odyssey' given to me by a friend," said Udana Marasinghe, a Colombo high school student who went to pay his respects Friday. Born in western England on Dec. 16, 1917, Clarke earlier worked as a clerk and served in the Royal Air Force during World War 11 before moving to Sri Lanka in 1956. Clarke's 1968 story "2001: A Space Odyssey" — written simultaneously as a novel and screenplay with director Stanley Kubrick — was a prophecy of artificial intelligence run amok. Clarke was to be buried Saturday at Colombo's general cemetery in a plot owned by his friend and business partner with whom the writer lived for decades. The government is in the process of re-deploying security forces including army volunteer units and Police Special Task Force (STF) in the Northern and Eastern Provinces and the Weli Oya region to facilitate the ongoing offensive on the Jaffna, Vanni and Weli Oya fronts. The withdrawal of the STF from parts of the Ampara District for re-deployment in the North Central Province would be part of the overall security plan under which the three forces, too, would shift both men and material, Defence Secretary Gotabhaya Rajapaksa said. Dismissing allegations that the STF would be moved out of the Ampara-Batticaloa region to facilitate an electoral pact with the breakaway LTTE group TMVP ahead of the forthcoming elections to the Eastern Provincial Council, Rajapaksa said the STF would continue to maintain a sizeable presence in the Batticaloa District. In fact, their presence in the Batticaloa District would be strengthened to face any eventuality, he said. The majority of STF units are deployed in the Batticaloa District, the main TMVP`s stronghold. The Defence Secretary criticised attempts to give a political twist to the re-deployment plans by linking it to the forthcoming Eastern PC election. The former infantryman asserted that the re-deployment of both men and material would be inevitable as the offensive action on Jaffna, Vanni and Weli Oya fronts had reached a decisive stage. Fielding questions, he said the government would continue to shift troops to meet the overall military objectives. Nothing would be done to weaken the existing security arrangements in the Eastern districts of Ampara, Batticaloa and Trincomalee where government forces had taken the upper hand with the fall of Thoppigala last year. He said government plans are on track. The Defence Secretary said the STF had the expertise and the capacity to enhance security in Padaviya, Kebitigollewa and surrounding areas that would facilitate the overall security objectives as the army advanced on LTTE positions on the Vanni and Weli Oya fronts. Their presence would boost confidence of the people, he said while urging people not to be misled by ridiculous statements. He asserted vital security considerations had to be met as the army advanced further into the enemy-held territory. The LTTE struggling on all fronts is also believed to have re-deployed both personnel and assets, particularly heavy guns on the Vanni front in a bid to stall the army. He rejected claims the TMVP had demanded the immediate withdrwal of the STF. The areas vacated by the STF would be taken over by the army and the navy, he said. The official emphasised action was being taken under a cohesive strategy to weaken Tigers as repeatedly pointed out by the government and service chiefs. In a recent interview with The Island, Army Chief Lt. General Sarath Fonseka said the regaining of the entire Eastern Province would be part of the overall campaign against the LTTE. He asserted various battles, offensive actions and related matters including deployment of men and material shouldn`t be considered in isolation but viewed with the overall picture. Both the UNP and JVP had claimed the TMVP wanted the STF to quit the Batticaloa-Ampara region. Both parties had demanded the immediate disarming of the breakaway LTTE faction ahead of forthcoming Eastern PC elections. Political sources said the then Elections Commissioner Chandrananda de Silva accepted the LTTE Political Front PFLT as a registered political party in December 1989 while it waged war against the IPKF. In fact, the issue of de-commissioning of arms hadn`t been at least discussed by UNP leaders, the sources said. According to the military reports reached from the Wanni and Jaffna defences 35 LTTE terrorists were killed while another 6 were wounded during the clashes sparked between security forces and LTTE yesterday, March 11. One soldier has made his utmost sacrifice while another 7 received injuries in this humanitarian mission launched to liberate the Tamil civilians in Wanni region from LTTE terror clutches. In Jaffna theatre of battle, army snipers deployed in Muhamalai front gunned down an LTTE terrorists around 5.10 p.m yesterday. Separately, army troops ambushed an LTTE movement in general area Killay in early hours yesterday. Ground troops confirmed that one terrorist was killed in this attack. Meanwhile, troops have launched an attack targeting LTTE bunker defnces in general area Muhamalai and 3 soldiers sustained injuries due to LTTE retaliation. The damages to the terrorist not reported yet. Troops uncovered a claymore mine from general area Sarasalai 5.30 p.m yesterday. According to the information, the claymore mine was weighing of 7kg. Twenty Tamil civilians belonging to five families, fleeing LTTE-controlled areas by a boat, sought the government protection at Pallimunai and Pesalai in Mannar yesterday (11th March 2008). In one incident, two Tamil families consisting eight (08) persons sought refuge of the government security forces at the Pallimunai Fishing Marshalling Point jointly manned by the Sri Lanka Navy and the Police, yesterday morning around 7.30 a.m. 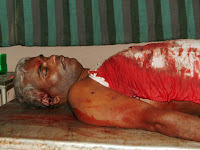 They had fled LTTE-dominated Vedithaltievu in two "Wallams" (locally made fishing craft) yesterday (10th March 2008) around 9.30 p.m. One Wallam had been fitted with an 8 Horse Power Out Board Motor (OBM) and the other Wallam had been on tow, tied to it. The Wallam which was on tow did not have an engine; yet it had four persons on board. One family consists of a father of 28, a mother of 27 and two daughters aged 4 and 2. The other family consists of four persons with a father of 26, a mother of 22 and two daughters aged 3 years and just 2 months. The heads of the families are fishermen by profession and one had not forgotten to sneak his precious motor cycle too on board his wallam though it added additional weight slowing down their escapade. TMVP leader Pillayan caste his vote for the Batticaloa local government elections at the Vipulananda Vidyalaya in Tethalai a short while ago. Speaking to our reporter at the site Pillayan said this was the first time he was casting his vote and added that he expects a “rising in the East” from tomorrow. The Navy says it is monitoring the movements of a “suspicious” ship 150 Nautical Miles off the Eastern coast. It has been found that a large number of people are on board of the ship and authorities are trying to figure out whether it was into human smuggling or smuggling weapons to LTTE.